I got a Savonnerie bundle for my birthday. Beautiful, but more "formal" than the fabrics I have been using. It will be my fifth quilt and I have at least some technique under my belt from having taken pretty challenging beginner & intermediate classes. Don't think I'm ready for a great deal of appliqué, and I still tend to get frustrated with lots of Y seaming. What pattern would you use with this beautiful fabric? I google the FQ bundle to see what it looks like. Here is a thread here on the site with a pretty quilt that may look nice with that bundle. http://www.quiltingboard.com/picture...t-t160415.html It is a bit more of a causal quilt. Not sure what your looking for. Good luck. Here is a link to a picture of the fabrics. I have no idea either as what to do with it. Maybe anything that would work with French Provincial would work???? Check out www.sweettreat.com They specialize in FQ bundles and have lots of patterns that use 8 FQs and some yardage. Also, google "wickedly easy quilt". Last edited by mckwilter; 07-30-2013 at 08:09 AM. Once I had a FQ bundle that was pretty, but too formal for my style. I used the least formal approach - I cut the FQs into 9" squares and made a rag quilt. It is still my family's favorite quilt. I used natural muslin for the back squares and I used 8" squares of scrap batting in between. You can use the squares to practice FMQ or quilt a simple X. Join them with 1/2" seam, with the seam showing on the right side of the quilt. Cut the seams 1/4 to 3/8" deep about 1/2" apart. The more you wash your quilt the raggier it will look - totally informal, with formal fabric. My kind of quilt. Last edited by Tashana; 07-30-2013 at 08:34 AM. Love your fabrics. How about something like one of these. I have the Dora pattern if interested. Maybe a churn dash. Did you see this one? Thank you for the ideas everyone! I have used several of their patterns. 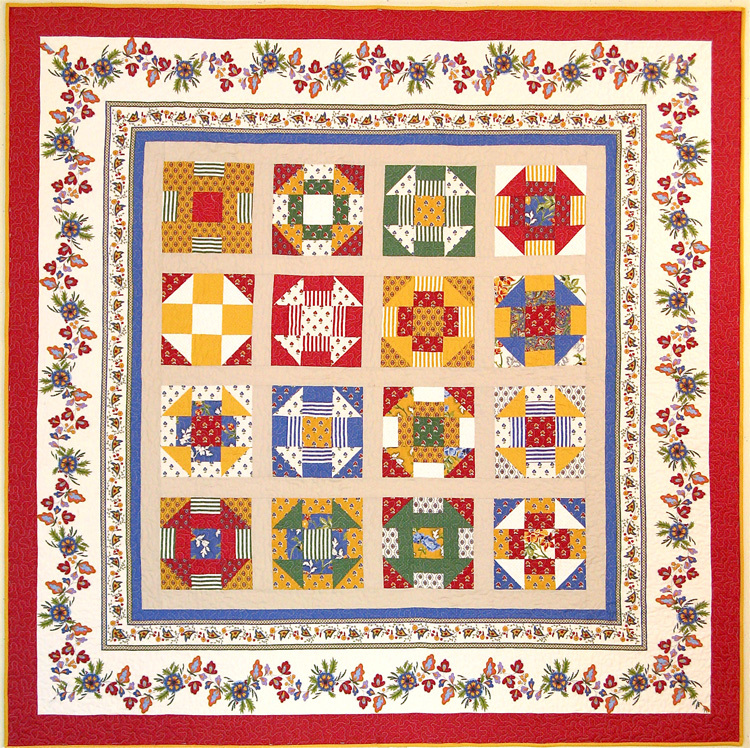 They are well written and easy to follow and make beautiful quilts. Just whipped up a "Flim Flam" from their patterns yesterday. Check the Moda website, they have free patterns and may have one for that fabric line. What about one of the Turning Twenty patterns? They are all designed to use 20 fat quarters.........some (if you have another focus fabric or do machine embroidery, allow you to add 10 blocks that have either embroidery or have been fussy cut from the focus fabric........Quick quilts but really nice......Love the fabrics!! Yellow Brick Road. Easy and made for using fat quarters. I could not agree more!! When I saw the fabrics I immediately thought Yellow Brick Road. Annie's has a pattern similar to the Crème Brulee. It's called Wrap It Up. That layer cake has good contrast. I would be reluctant to do anything with half-square triangles because of the stripes. A rail-fence would be good. Or the picket fence star that someone posted in the past few days.